NewsKit is suitable for all sorts of magazines, blogs, and audiences. It’s designed to provide a quick and easy solution for people who want to create a professional-looking online portal also about their own city or local community. NewsKit is an all-in-one modern, stylish Joomla template which allows you to highlight your most important or latest contents. As always, the demo layout is very intuitive and can be easily customized. Based on a modular Bootstrap design, NewsKit is natively responsive, cross-compatible with browsers, desktop and mobile devices. The template can be used with any language as it is natively translation & RTL ready. It also supports Retina display standards for higher resolution graphics. NewsKit is developed on JoomShaper’s award-winning Helix3 template framework. 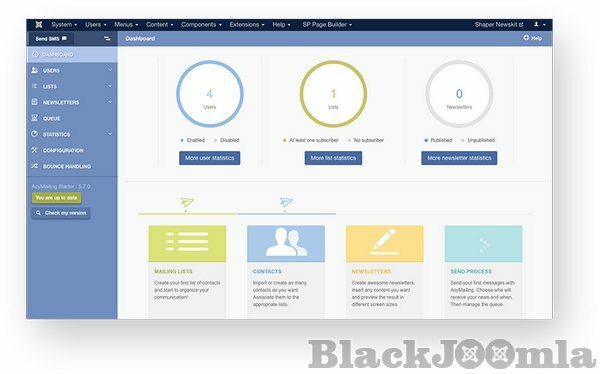 It utilizes SP Page Builder Pro ($49 value) for building pages, and provided for free in the template QuickStart package. Adding, editing, and customizing elements on a page is really fast and intuitive with the live frontend visual drag and drop system. AcyMailing newsletter integration is also a big plus. While we provide 4 preset colors inside, you can get unlimited color schemes using Helix options. Build your successful magazine website in a few hours! 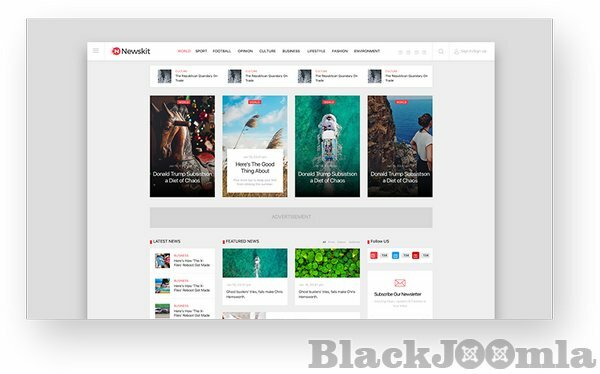 NewsKit is the July 2017 Joomla template from JoomShaper. It is an excellent template for any type of newspaper, magazine, professional blog, fashion blog, editorial, publishing or review site. 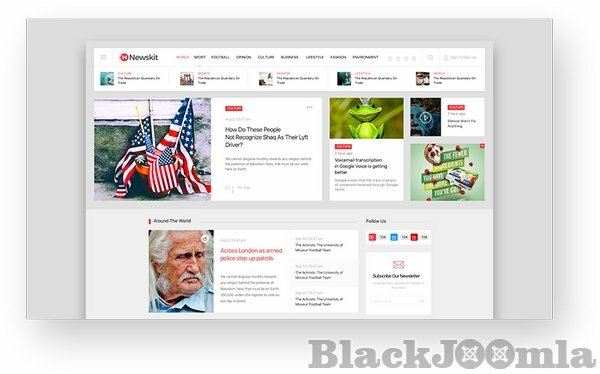 NewsKit is a fully responsive template with which you can also build any news niche such as tech, politics, sports, health, games, and fashion site easily. Developed with SP Page Builder Pro drag and drop design system and Helix3 template framework, NewsKit comes with SP Poll component and SP Tweet module that shape a richer and effective news portal. 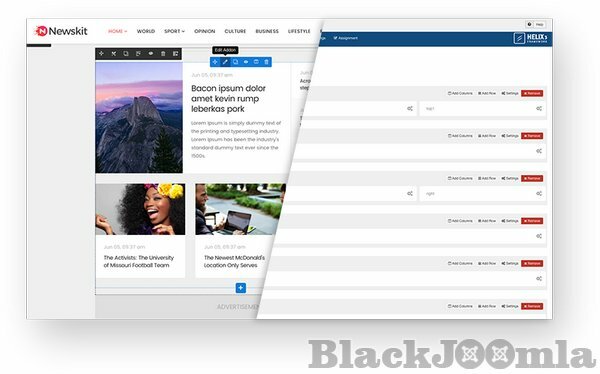 The NewsKit template package comes with a range of features necessary for building a successful news site. Let’s see the NewsKit features at a glance. NewsKit is packed with SP Page Builder Pro ($39 value) which comes for free with the template package. Being translation, RTL and Retina ready, NewsKit offers absolute freedom in content strategy. Start building your website with NewsKit right away to launch the best of the best news website today. Please find the detailed features below. NewsKit comes with two different home variations each with distinct styles and content placements. Also, there are 4 preset colors and 2 header and navigation menu styles. You can style the entire template with the 4 different preset colors. If you want, you can style them with any of your prefered color. The NewsKit template has 2 homepage layouts giving you the opportunity to choose the suitable one for your portal. Home variation one has a unique way of displaying contents in different categories. The video category of this home variation made it so special. The default home layout has an article slider right below the header area displaying your news in a stylish way. The layout presents each category of the contents in a place where it suits the most. The default home layout has video and image areas where your visitors can watch videos and see photos. It places the poll component on your right and your Twitter feed right above the footer. The second homepage design is a lot different from the default home layout but it does not deviate from the core news spirit. It has a simpler design and noticeable presentation of stories. There is a card-style news showcasing on the top which shows the news items with different categories. 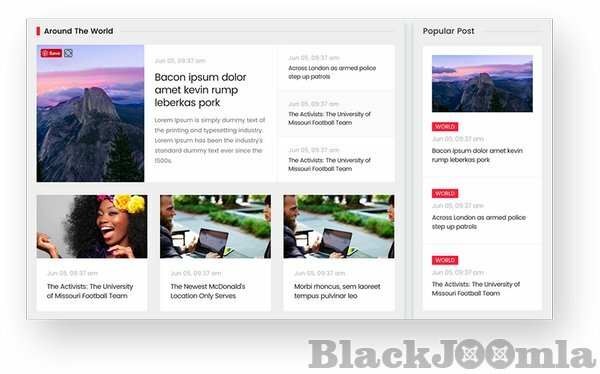 Your visitors will find it more comfortable if they want different news categories to be found in a single grid. The second layout places the latest news on your left making them more reachable for the visitors to read. The categories come in a descending order as per their importance to the visitors. Poll is what makes this template more interactive. Visitors will not only read the news but also they can take part in different polls you set on the site. We’ve used our SP Poll component in this regard. Poll can be set up very easily with questions and multiple options. You can give as many choices as you want but a minimal number would suit the design the best. Your visitors can see the result of a poll instantly. Clicking on the poll submit button will take them to the result. They can click on the result option to see it too. Alongside having a stunning layout to display different news on your site, the Article Headline addon will add an extra attraction. The addon can show the news in moving slides just below the header. You can set those slides with the news title and thumbnail images of that particular news. Displaying the news category is also possible with this article addon. The Article Slider addon basically draws the attention of the visitors intending to have them to read more news of your site. So expect a higher traffic! You may not be satisfied with just the beauty of the layouts. 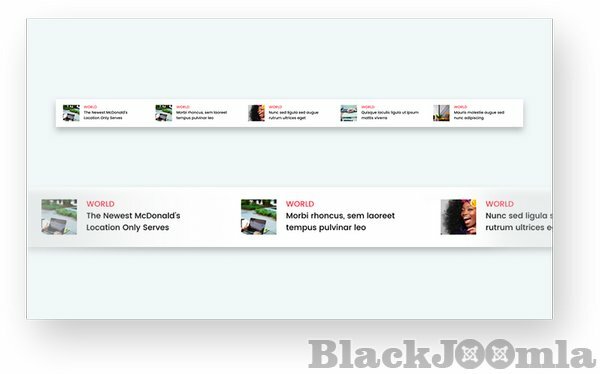 That’s why we went one step forward in designing a special article slider addon. You can present your top stories boldly using the Article Slider addon in NewsKit. It will play a vital role in showcasing the lead news items and ensure the maximum reach. Your news stories will get an eye-catching expression if it is rendered via the article slider. Users can slide between stories and open links instantly. Images beautify a website in many ways. The right display of the images adds much value to your news site. The Thumb Gallery addon will let you add images to a gallery and display on your online newspaper. A single image can tell worth more than thousands of words. From this point of view, the Thumb Gallery addon plays a very important role in making your news site a better place to find news in the most relevant way. 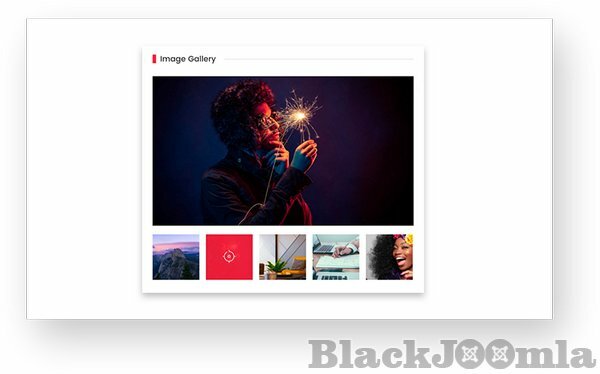 This gallery will display images in a large area upon clicking on any item in the gallery. Setting them up is easy with this addon which means greater convenience for both the visitors and the editors. Being a news outlet, it is a good idea to display your tweet streams on your site. SP Tweet module lets you show all the latest tweets in a select area on your site. 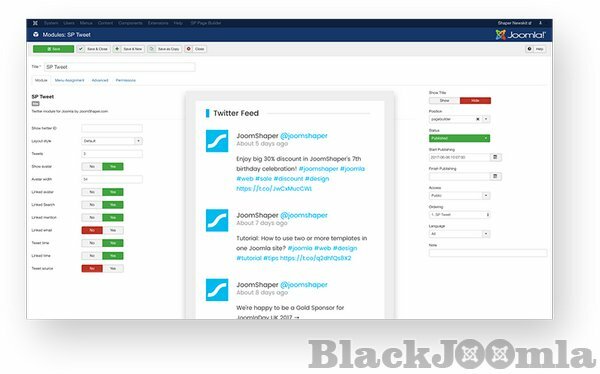 Displaying your Twitter feed is no more a task full of hassles as our SP Tweet module covers that for you. Customize the module to integrate your Twitter feed right on your webpage. You can display the Twitter feed anywhere on your news site with this module. Its functionalities allow you to customize the position of your Twitter feed as you wish. The improved Article addon will let you display your articles in an amazingly beautiful way. The best thing about this addon is that it brings grace and style to your article display. Articles are displayed with nice thumbnailed designs that alone guarantees reader engagement and visual friendliness. Stories come with a nicely designed social media share option which is crucial for ensuring the maximum exposure of the articles. The Tabbed Articles module lets you display your articles with a nicely designed tabbed section also position it to your desired webpage location. In NewsKit, the tabbed article addon is used in the menu. The design and outlook is ensured in such way that anyone will be stuck with its attractiveness. The tabs are activated whenever you hover over the tab and show the articles in grids which makes it a breathtaking user friendly design. NewsKit is packed with AcyMailing newsletter component in the template package which will give you a new way to communicate with your prospective clients and stakeholders using its operative mailing system. With AcyMailing, you can create newsletter subscriber list, manage subscribed email lists, run product campaigns as well as deliver news and announcements easily. AcyMailing’s pre-built newsletter templates will let you launch your email campaigns in the quickest way possible. If you want a more customized look and feel, you can do it as well. NewsKit is composed with SP Page Builder Pro which lets you style and decorate your web pages live with its awesome front-end editor. It’s based on top of Helix3, the best ever Joomla template framework. SP Page Builder has the most advanced frontend page composer mechanism that gives you lots of functionalities for creating eye-catching web pages visually. No need of coding a line! With the great flexibility of Helix3, develop an unlimited number of layouts. Style, customize, develop your own sections and get totally responsive layouts.